NBA 2K Playgrounds 2 is a fun arcade basketball game that is ruined by its desire to empty your pockets at every possible moment. There are two things you’ll notice upon starting NBA 2K Playgrounds 2, the new arcade basketball title from developer Saber Interactive and publisher 2K Sports. First, you’ll see a user agreement that, for some reason, feels like reading Tolstoy’s War and Peace. Second, immediately after agreeing to the game’s terms of service, you’ll notice the game’s Player Packs. 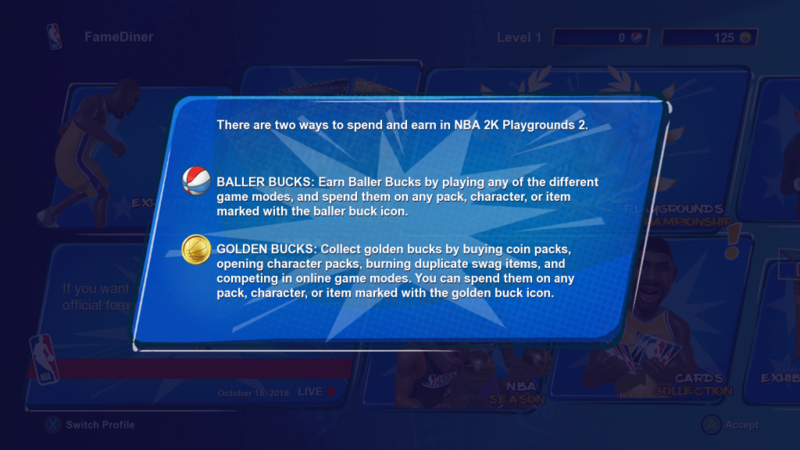 Yes, before you make your first slam dunk, NBA 2K Playgrounds 2 introduces you to its lawless ecosystem of in-game currency, Player Packs, and informs you that you can insert real-life currency to get more of each. Allow me to be blunt for a second—writing about microtransactions in 2018 is inherently dull. 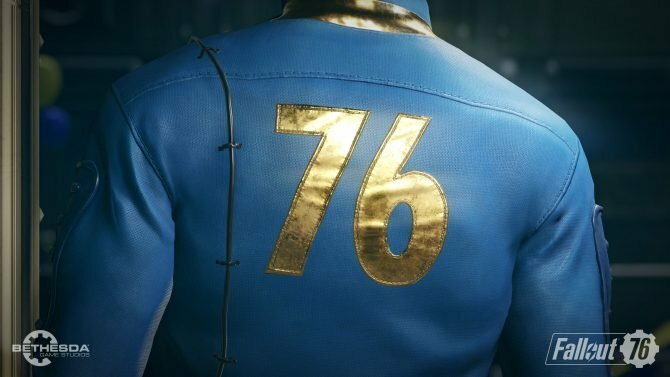 Microtransactions have been the cornerstone of a (now decades old) cultural debate about how video games should be made, monetized, and distributed. Every possible position on the matter has been beaten to death by a subset of sensationalist bloggers, self-righteous YouTubers, and others of their ilk. One of the most prevalent myths about microtransactions, even from the most well-meaning pundits, is that they’re a necessity in contemporary game design. Often folks will bandy on about how microtransactions are a necessary evil, a counter-measure introduced to combat the cost of AAA, bleeding-edge game development. Yes, this is true to a degree. At the very least it highlights an uncomfortable truth; current bleeding-edge, AAA design tactics make game designers work too long to create games that are too big, which enables companies to sell experience boosters so other people that work too long can actually play them. It’s impossible to view any of these branches in a vacuum—they are all hopelessly and ontologically connected. Yet, Playgrounds 2 upends the myth that microtransactions are a necessary evil entirely. There’s no way that the spiritual successor to NBA Jam costs so much money to make that its microtransactions are a necessity. In fact, I was initially shocked when I found out that the game retails for $29.99–and that was before I knew the extent to which the game’s content was hidden behind tedious grinding. The seemingly nuanced argument that microtransactions help foot the bill for modern game design seems foolish when confronted with the reality of games like Playgrounds 2. If it seems like I can’t divorce my thoughts on microtransactions from the game’s gameplay, it’s because the game doesn’t allow me to. 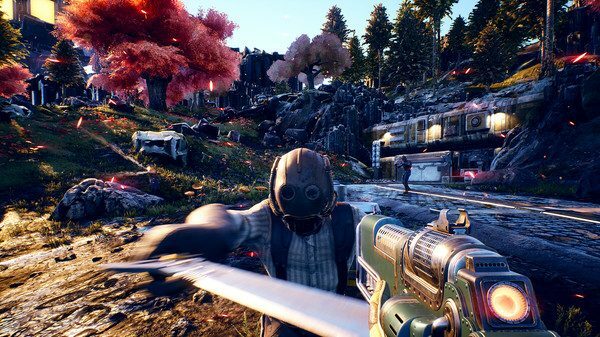 If you’re reading this review and wish I talked about the game’s mechanics before jumping on a soapbox, know that I wish I could too. However, every time I booted up my Xbox One, eager to find some redeeming factor in Playgrounds 2, I was left frustrated, and honestly, kind of mad. Allow me to give you an example. Upon starting Playgrounds 2 I played a few exhibition games to learn the game’s controls. In this regard, the game is relatively solid. When on the offensive, players have the opportunity to shoot, slam dunk, pass, or set their teammate up for an alley-oop. When on the defensive, players can block shots, push their opponents, and attempt to steal the ball. When attempting a shot, a meter will appear asking players to time the shot perfectly. Every character in the game contains different stats, meaning, every character’s meter is different. Allen Iverson’s meter for three-point shots leaves a large margin for error, thus, making it incredibly easy for him to sink three-pointers. Shaq, on the other hand, has an incredibly small meter for three-point shots, making them not a viable option. While this in-game system of checks and balances gives the game nuance, it also makes the game a tedious grind. You see, upon starting the game, players are only given two characters from each team. 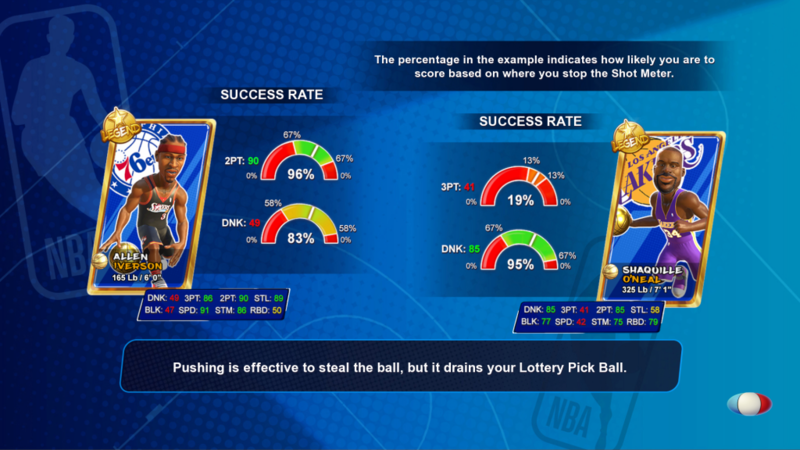 The rest of the players can be found in Player Packs or bought using baller bucks, the game’s in-game currency. Here’s the rub–these players cost a lot of baller bucks; the average player costs around 10,000 baller bucks and a superstar player like LeBron James costs 25,000 baller bucks. For context, my first hour of gameplay netted me a whopping 3,000 baller bucks. Speaking candidly, the two players from each team that Playgrounds 2 gives you at the beginning of the game aren’t the best players. Diving into the game’s NBA Season mode I chose the Knicks because I’m a New Yorker and I love being miserable. However, neither of the two Knicks starters that the game providers can make a three-point shot to save their lives. This means that their skill-set is very limited to driving the ball into the paint or trying to dunk on opponents. Since all of the game’s variety and nuance is hidden behind grinding (or worse, a paywall) playing Playgrounds 2 started to feel like a chore. This is a shame because underneath Playgrounds 2‘s questionable business practices is the framework of a fun game. Playgrounds 2, in true arcade style, introduces a bunch of wacky gameplay mechanics that work to keep the tradition of 2v2 arcade basketball alive. Players can earn power-ups that make them super-powered, earn extra points by following on-screen cues, end up with a frozen basket, and more. 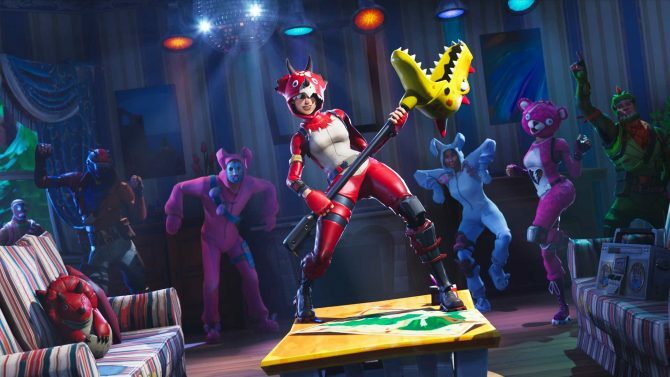 Despite the obvious missteps in how Playgrounds 2’s content is distributed, there’s no denying that the game has a lot to offer. 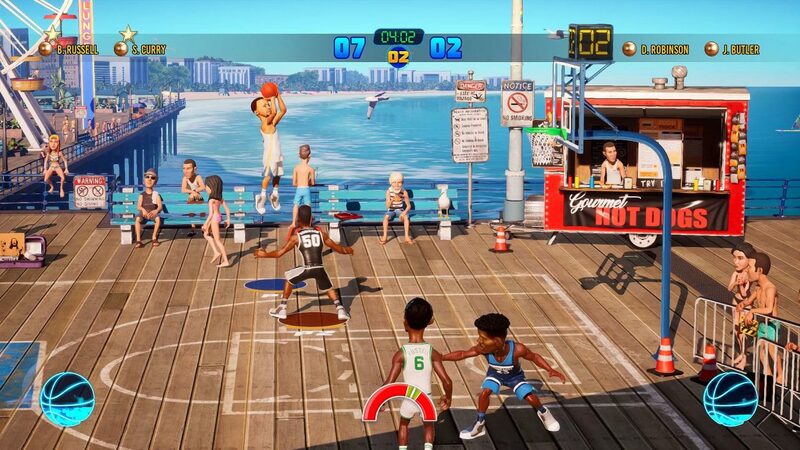 The game has four hundred characters, online play, couch co-op, a Three-Point shootout mode, and ten different basketball courts. The game’s officially-licensed NBA players work to make Playgrounds 2 more visceral–that is, is if you can afford to grind for them. In this regard, folks that don’t mind shelling out extra money to unlock all of the game’s characters or have the time to grind will find a lot to enjoy in Playgrounds 2. If you have the drive (or the time) to grind in Playgrounds 2 as if it were a mid-90’s JRPG, the game has plenty of redeeming qualities. The game’s 2v2 nature makes couch co-op a competitive godsend for basketball fanatics and old-school NBA Jam players alike. The controls are solid, the dynamics are fluid, and the game’s promise of mayhem-infused basketball is ultimately delivered. The sheer amount of players that NBA Playgrounds 2 allows players to unlock is ultimately impressive while the game’s different stages help to keep things fresh. If your will to play a genuinely solid, well-crafted arcade-basketball title won’t be weakened by the prospect of dealing with seemingly egregious business practices, Playgrounds 2 is the game for you. It’s worth noting that you can unlock all of the characters in the game for $9.99. I’m fully aware of that; however, it doesn’t change any of my thoughts on Playgrounds 2. The way that this game tries to empty out your pockets is not accidental– it is clear and calculated. Above all, I feel bad for the hardworking developers at Saber Interactive that had to sit by while their game was turned into a piggy bank by 2K Sports. 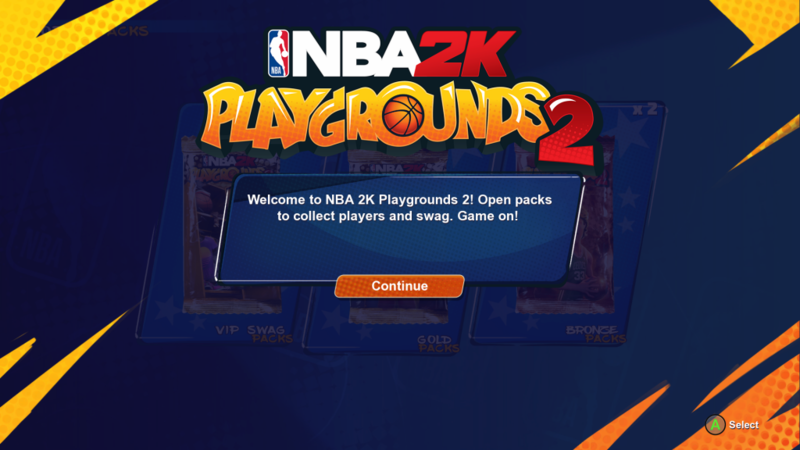 While there’s no definitive proof that Playgrounds 2 was any different before 2K Sports bought the game’s publishing rights a few months ago, I would personally feel foolish to consider it. When it’s all said and done, Playgrounds 2 provides a somewhat enjoyable experience that’s not worth its headache. If you want a quick and easy, arcade-style way to play basketball with your friends, you should just go to your local arcade with a fistful of quarters and play NBA Jam. Trust me, even though you have to feed the cabinet money after each game, you’ll still feel less exploited. 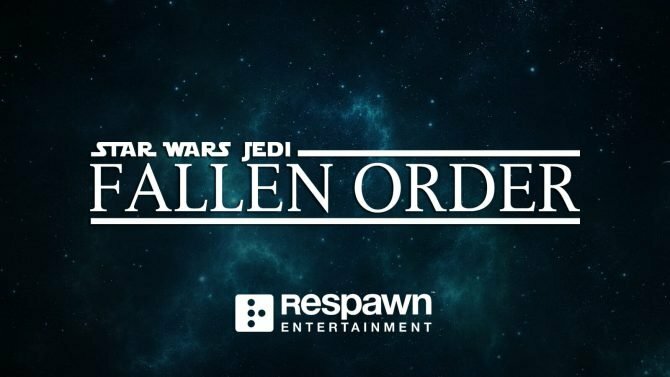 Respawn Entertainment's Star Wars Jedi: Fallen Order will not feature multiplayer or microtransactions.